MacOdrum Library - Carleton's Institutional Repository: Thinking Big or Small: Does Mental Abstraction Affect Social Network Organization? 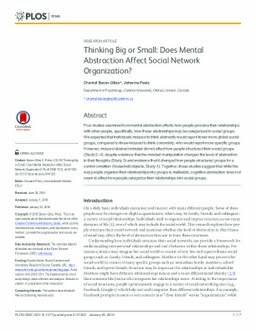 Thinking Big or Small: Does Mental Abstraction Affect Social Network Organization? Four studies examined how mental abstraction affects how people perceive their relationships with other people, specifically, how these relationships may be categorized in social groups. We expected that individuals induced to think abstractly would report fewer more global social groups, compared to those induced to think concretely, who would report more specific groups. However, induced abstract mindset did not affect how people structured their social groups (Study 2-4), despite evidence that the mindset manipulation changed the level of abstraction in their thoughts (Study 3) and evidence that it changed how people structured groups for a control condition (household objects, Study 4). Together, these studies suggest that while the way people organize their relationships into groups is malleable; cognitive abstraction does not seem to affect how people categorize their relationships into social groups.